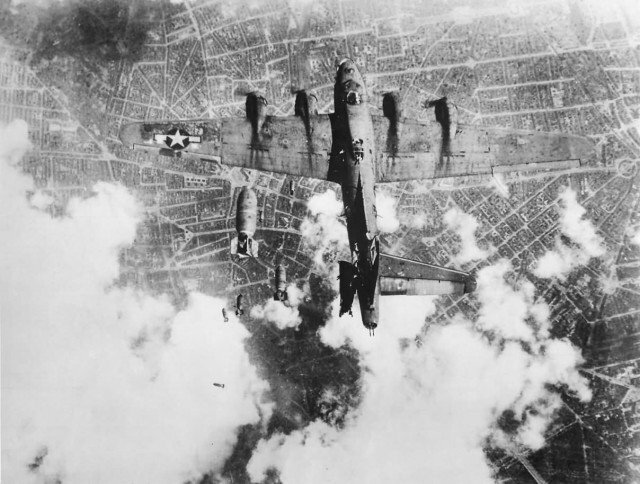 The strategic bombing campaign during WWII cost the lives of roughly 160,000 Allied airmen and 33,700 planes in the European theater alone. 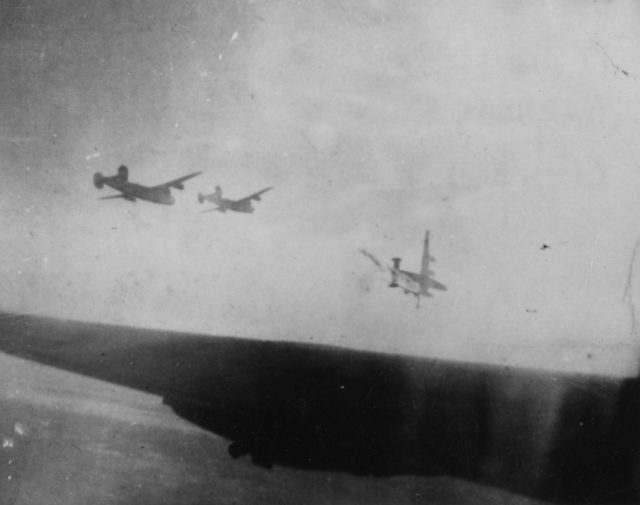 We have collected incredible images of the last moments of World War II bombers. Wherever possible we have added information to the images about the crew’s fate. 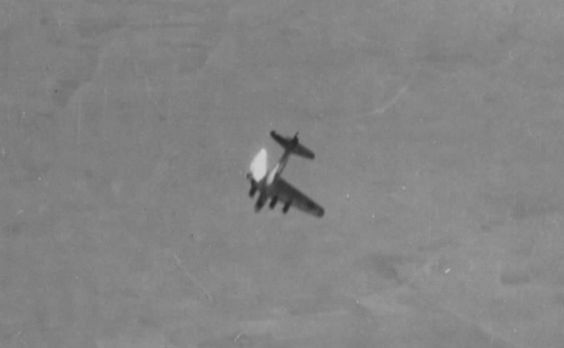 B-17G 42-37781 “Silver Bullet” was lost after bombs away when bombs from a higher flying group (379BG) hit this aircraft, knocking tail completely off in front of stabilizer. The aircraft dived straight down into a spin with all four engines going, crashed in Berlin, Germany. March 9th, 1944. 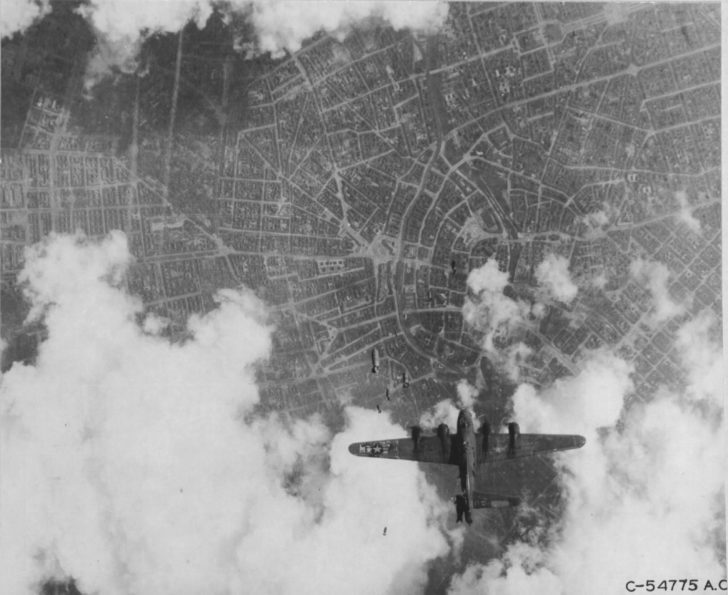 B-17 Flying Fortress 486th Bomb Group over Merseburg Lutzkendorf November 1944. 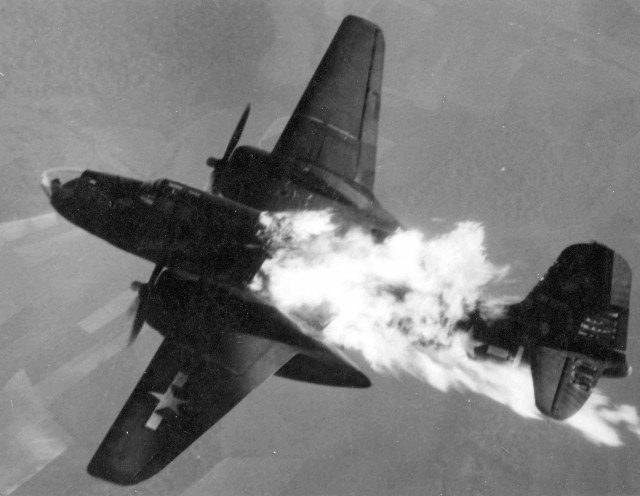 Douglas A-20J-10-DO (S/N 43-10129) of the 409th or 416th Bomb Group after being hit by flak over Germany. It burst into flames and crashed a mile west of the target; two chutes were seen to come out of the plane. Its crew was 1st Lt Robert E. Stockwell, pilot, 2d Lt Albert Jedinak, bombardier-navigator, S/Sgt Hollis A. Foster and S/Sgt Egon W. Rust, gunners. Lt Stockwell had been with the Group almost from the beginning of its existence. 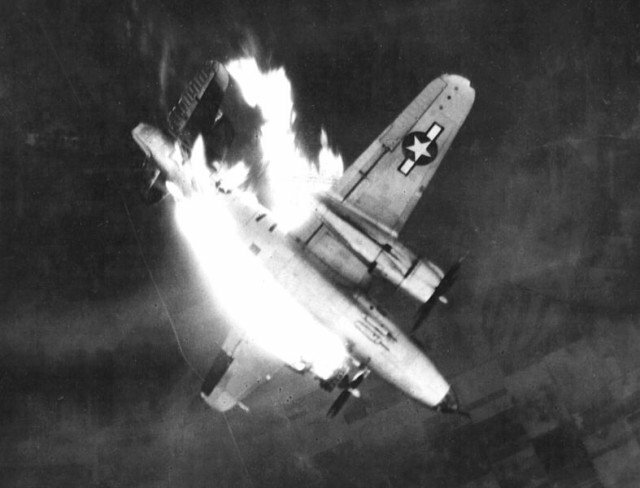 B-24H Liberator 42-94812 “Little Warrior” of the 493rd BG, 861st BS hit by flak over Quakenbrück Germany – June 29, 1944. One crewman managed to bail out safely but was killed by civilians on the ground. A U.S. Army Air Forces Martin B-26G-11-MA Marauder (s/n 43-34565) from the 497th Bombardment Squadron, 344th Bombardment Group, 9th Air Force. 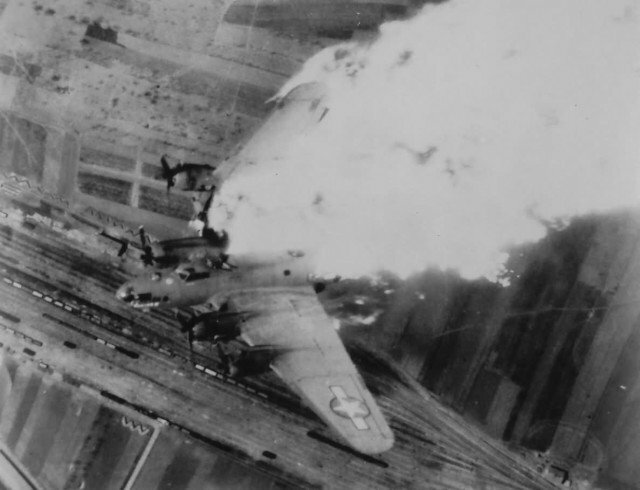 It is enveloped in flames and hurtling earthward after enemy flak scored a direct hit on the left engine while aircraft was attacking front line enemy communications center at Erkelenz, Germany. 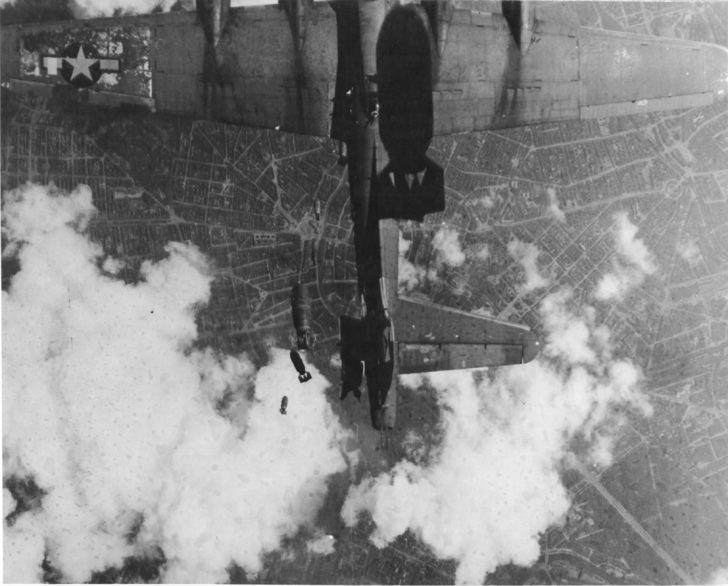 Boeing B-17 of the 483rd Bomb group brought down by flak over Nis, Yugoslavia, April 1944. The U.S. Army Air Force Consolidated B-24L-10-FO Liberator, s/n 44-49710, named “STEVENOVICH II,” of the 779th Bombardment Squadron, 464th Bombardment Group. It was shot down by Flak during an attack on ground troops near Lugo, Emilia-Romagna, Italy, on 10 April 1945. 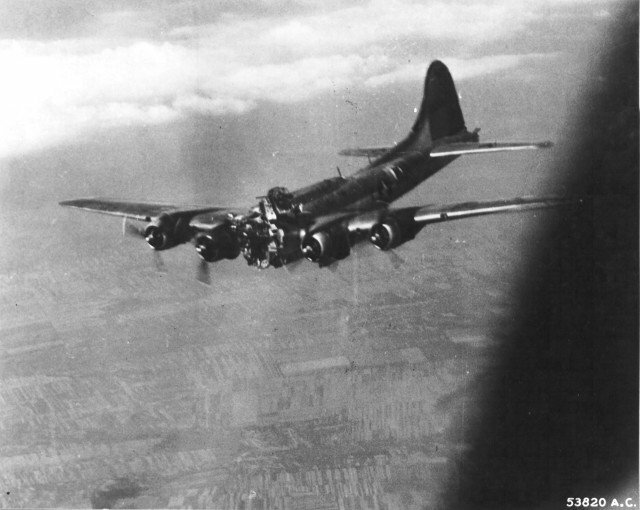 Boeing B-17G Wee-Willie 42-31333 LG-W, 323th squadron of 91st bombing group, over Kranenburg, Germany, after her port wing was blown off by flak. 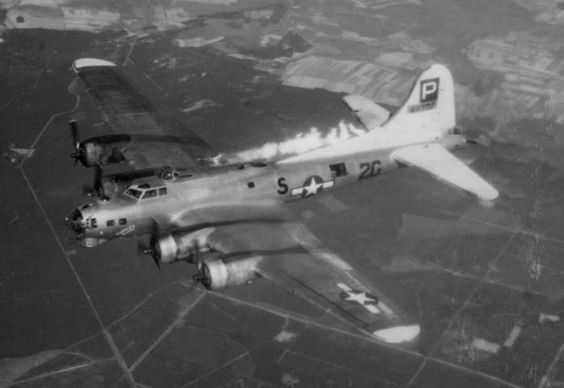 Only the pilot, Lieutenant Robert E. Fuller, and one crew member survived. 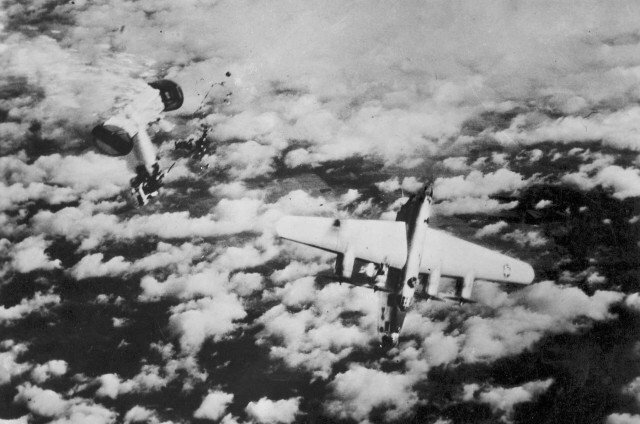 On 4th April 1945, Liberators of the 448th Bombardment Group, 2nd Air Division were attacked by Me-262 jet fighters. They were on a mission to bomb the fighter bases in Germany where the ME-262 was stationed. The formation was attacked by approximately 50 Luftwaffe Jet and Rocket aircraft. 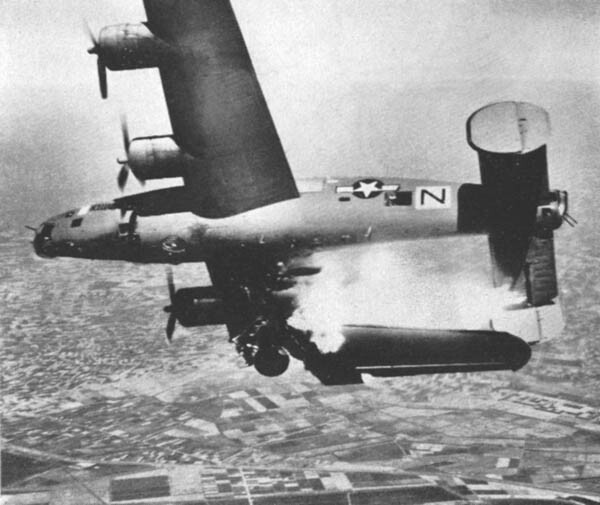 A total of eight B-24 Liberators were lost, including the one on the picture; 44-50838. 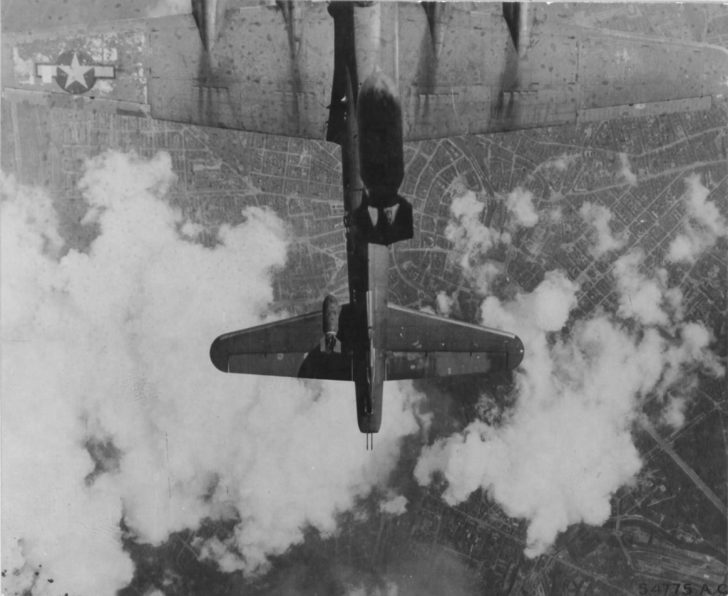 B-17G Fortress “Mizpah” took a direct AAA hit in the nose on a mission to Budapest, 14 Jul 1944. Two crewmembers were killed instantly, but the pilot held her level long enough for the crew to get out and they were taken prisoner of war. 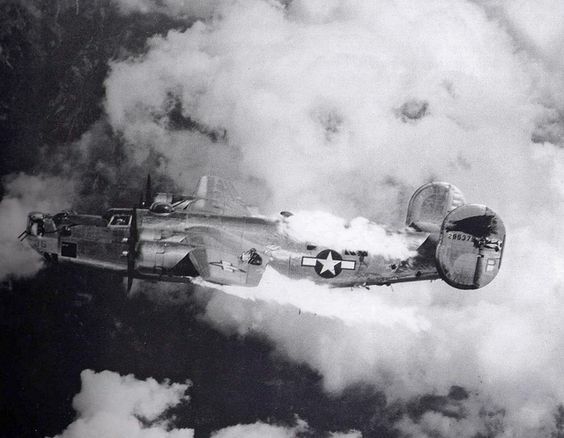 B-24 Liberator “Extra Joker” of the 725th Bomb Squadron, 451st Bomb Group after being attacked by German Focke Wolf 190 fighters over Austria on August 23rd, 1944. 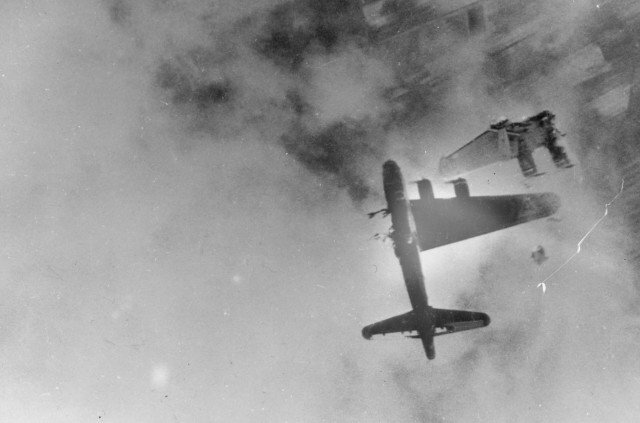 B-17G Fortress ‘Miss Donna Mae II’ drifted under another bomber on a bomb run over Berlin, 19 May 1944. A 1,000 lb bomb from above tore off the left stabilizer and sent the plane into an uncontrollable spin. All 11 crew members were killed. 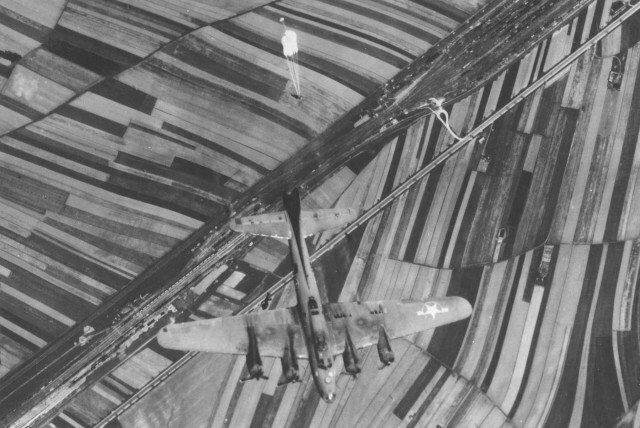 Crew bails out of damaged B-17F Fortress “Patches” at 22,500 feet over Wiener Neustadt, Austria, 10 May 1944. Eight members of the crew became prisoner of war, the other two were killed. 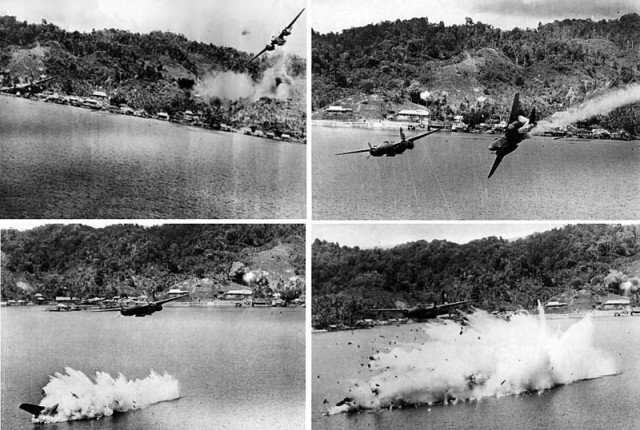 The crash sequence of a U.S. Army Air Force Douglas A-20G-25 Havoc (s/n 43-9432) during an attack on Kokas, Papua New Guinea, on 22 July 1944. 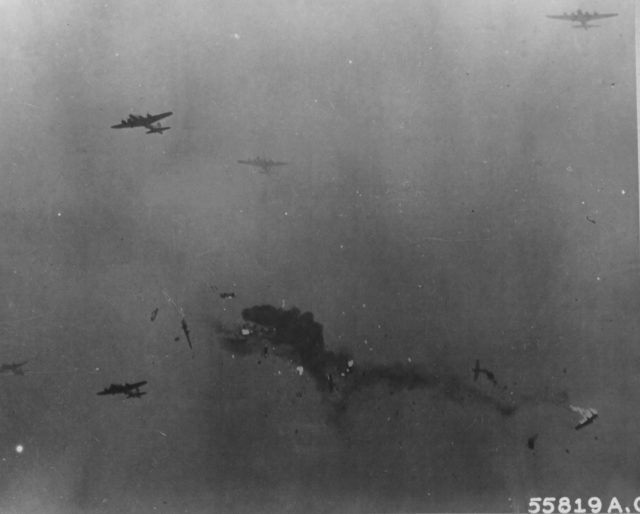 Twelve A-20s from the 387th Bombardment Squadron, 312th Bombardment Group, attacked the Japanese barge depot and seaplane station at Kokas. 43-9432 (tail code “V”) was part of the last flight over the target. This section was led by Captain Jack W. Klein (taking the photos), followed by 2nd Lt. Melvin H. Kapson (the other aircraft visible) and 1st Lt. James L. Knarr. Approaching from the inland side, they dropped 115 kg bombs which can be seen exploding in the background. Knarr’s aircraft was hit by anti-aircraft fire and crashed into the bay, exploding when it the sea. He and his gunner, SSgt Charles G. Reichley, were killed. 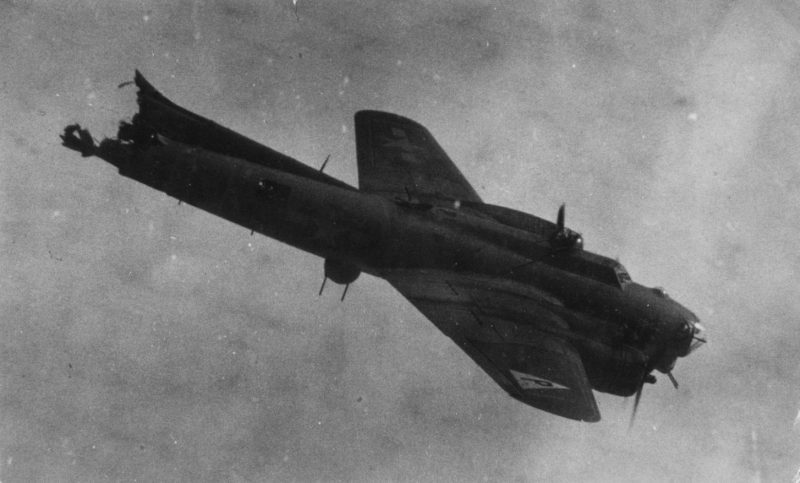 Allied B-17 of the 836th Squadron 10 April 1945. Cannon shells from a German Me262 ripped into its tail, perforating the vertical stabilizer & inboard right wing panel. Fire in No. 3 engine, flames swept back to the tail. They peeled off the formation shortly afterward and dropped behind. The Crew bailed out at RP, 7 miles West of Elbe River, later right wing came off and the plane crashed into the ground. A Handley Page Halifax B Mark III, LW127 ‘HL-F’, of No. 429 Squadron RCAF, in flight over Mondeville, France. The bomber lost its entire starboard tailplane to bombs dropped by another Halifax above it. 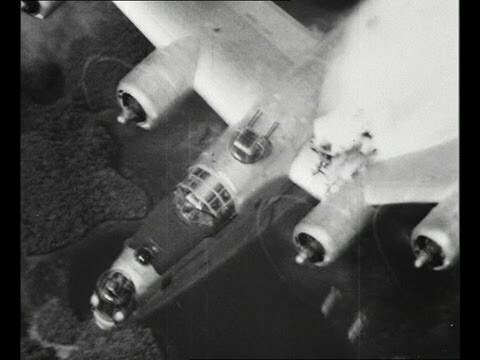 LW127 was one of 942 aircraft of Bomber Command dispatched to bomb German-held positions, in support of the Second Army attack in the Normandy battle area (Operation GOODWOOD), on the morning of 18 July 1944. The crew managed to abandon the aircraft before it crashed in the target area. B-24H Liberator bomber of 783rd Bomb Squadron, 465th Bomb Group, US 15th Air Force. It exploded in mid-air after being hit by anti-aircraft fire over Germany, 1944. 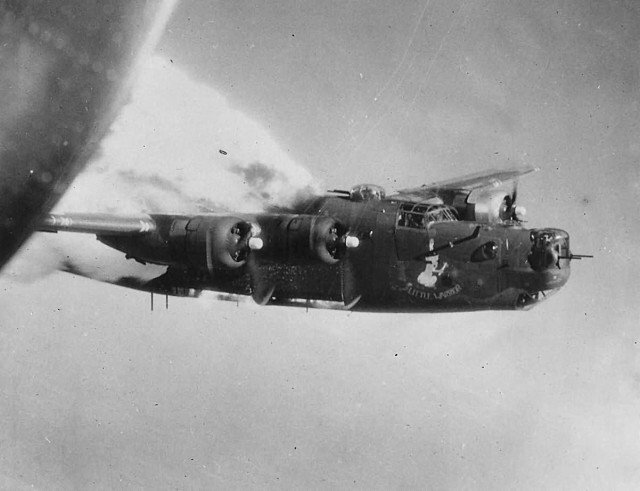 B-24J Liberator 44-40210 of the 854th Bomb Squadron after being hit by light flak during low-level supply drop for the 82nd and 101st Airborne near Eindhoven, Holland. Sep 18 1944. The pilot tried to land it in a field but there isn’t enough space and the bomber crashes into the trees and explodes. Only a gunner, Frank Di Palma, survived when he is thrown clear of the wreck being severely wounded. 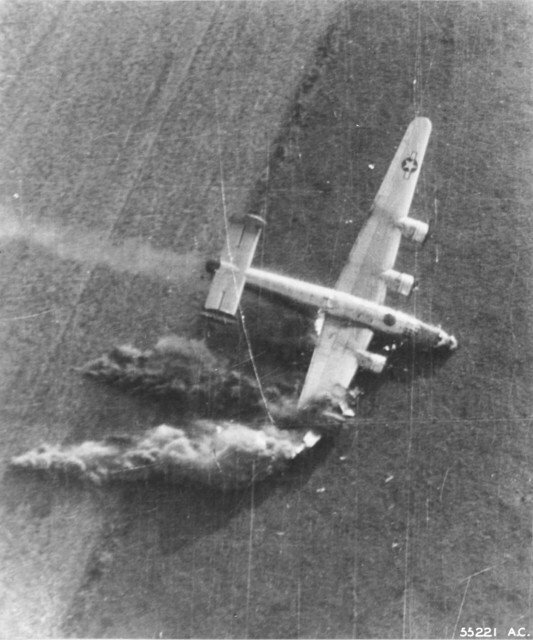 452nd Bomb Group B-17 going down after a direct hit by flak tore off the left wing over Chateaudun, France. 28 March 1944. B-26 Martin. 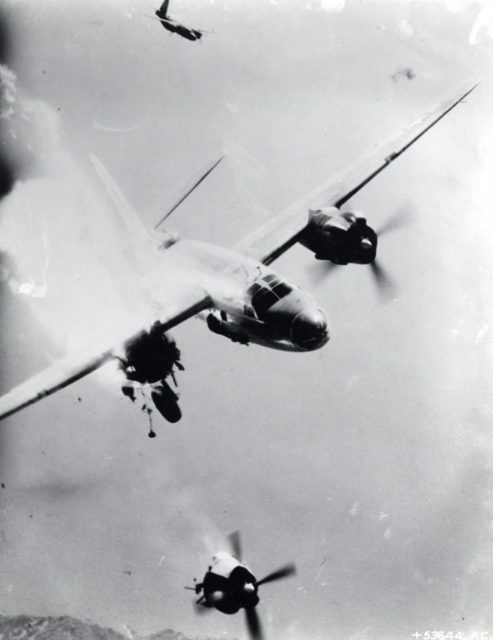 53644 AC- This Martin B-26 “Marauder” of the 12th USAF has just received a direct hit by a flak shell during an attack on enemy coastal defense guns in Toulon Harbor, southern France. 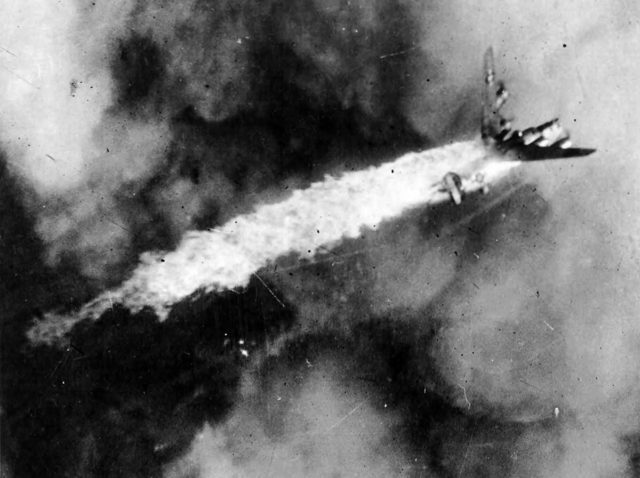 With the right engine sheared off and still turning and the wing ablaze, the plane crashed into the city a few minutes after this photograph was taken. 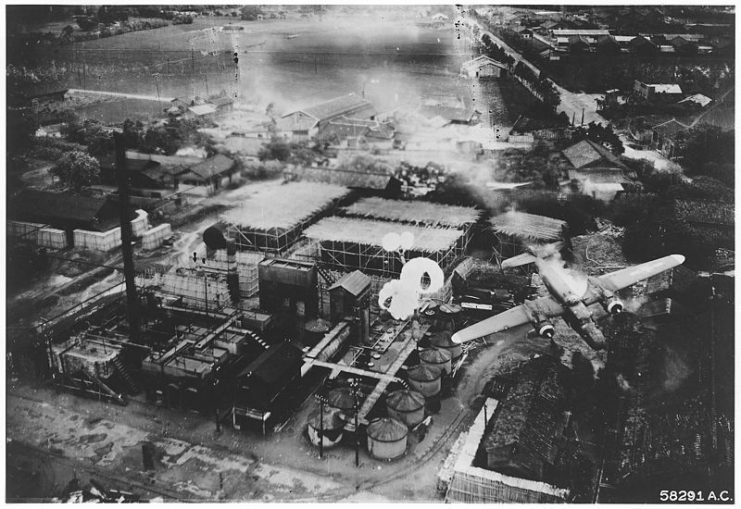 This horrific crash at Byoritsu oil refinery, Formosa, was photographed by a B-25 of the 5th Air Force’s 345th Bomb Group on 26 May 1945. Just as it released its string of para-frags B-25 NO. 192 was hit by flak from a camouflaged battery and trails smoke and a gaping hole is visible on the pilot’s s side. The aircraft visible is the North American B-25J-10-NC Mitchell (s/n 43-36192) “Jaunty Jo”. Crew : 2/Lt Robert J. Knauf Pilot, 2/Lt Martin H. Mulner Jr. Co-Pilot, 1/Lt Lloyd E. Bodell Navigator, Cpl Harold O. Montville Eng/Gunner, Sgt Tennyson C. Harrell Radio/Gunner. They were all killed in the crash. On 17 January (1945) a single shell dealt the 491st another severe blow. 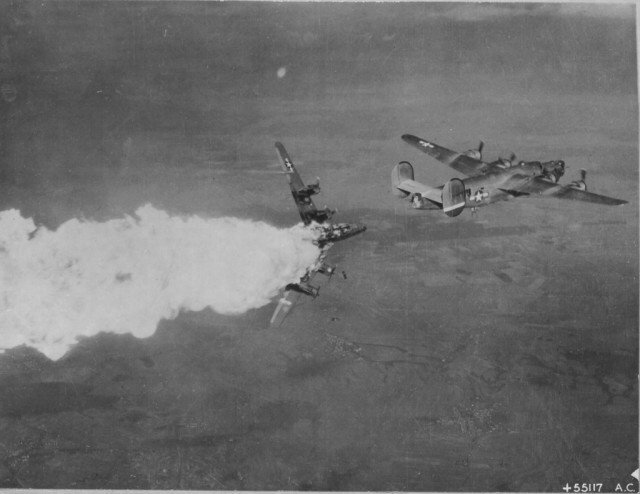 B-24 #42-51481, the Wing Lead aircraft for the mission, took a flak burst between the #3 and #4 engines. 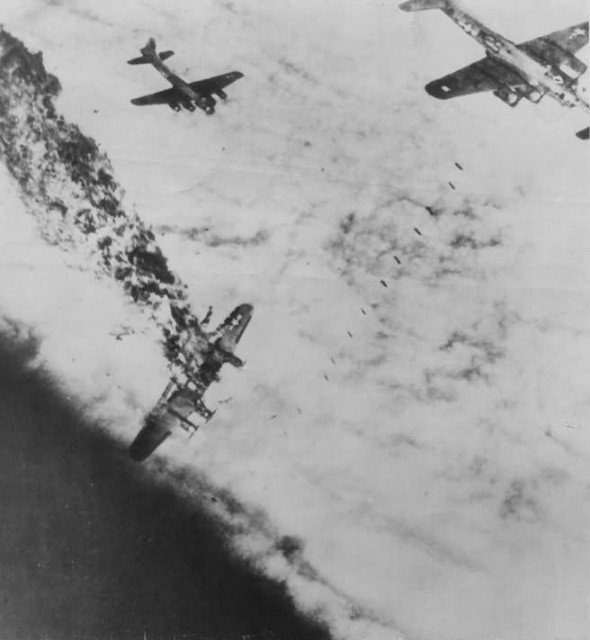 The wing broke off immediately and the bomber spun down carrying seven officers and five enlisted men to their deaths. The pilot, Capt. Dean B. Strain, was one of the last original Group pilots still flying missions. Cameras being readied for the strike photos followed the spinning aircraft down to the hard ground of Harburg. 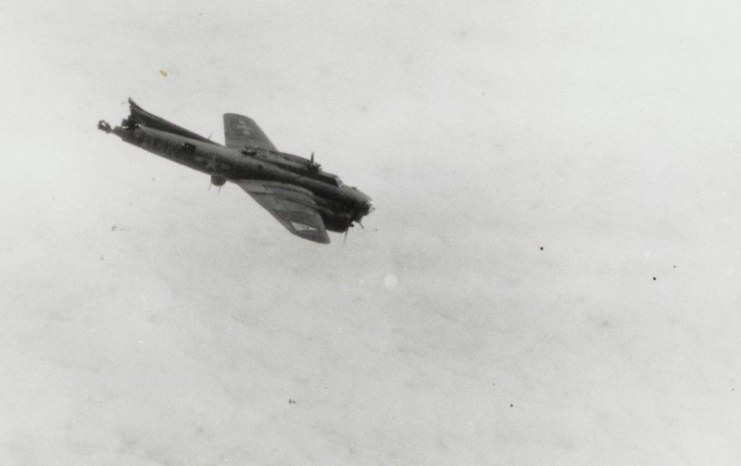 The collision of two B-17 bombers (Boeing B-17G-75-BO serial number 43-38030 and the Boeing B-17G-80-BO serial number 43-38133) of the 305th U.S. Air Arm in the skies over the English countryside Turley (Thurleigh). 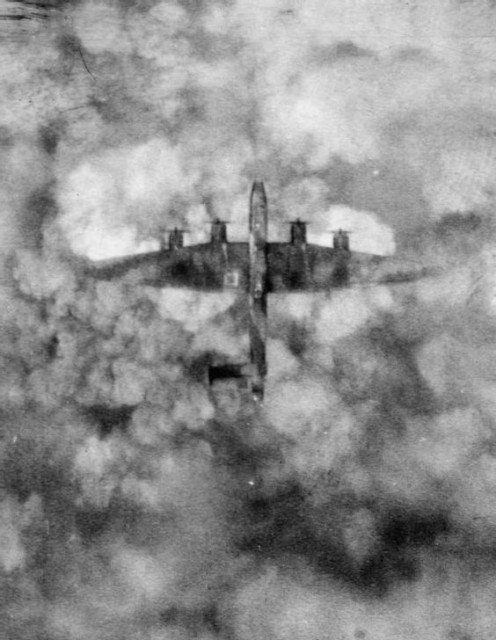 The collision occurred in conditions of poor visibility when returning aircraft bombing of Hanover. The crews of both aircraft (18 patients) died. This plane was nicknamed “Brief”. Serial Number 44-42058. It had taken off from Angaur Airfield, flying on a bombing mission against anti-aircraft installations on Koror, Palau Islands. Whilst over Koror, the B-24 was hit by anti-aircraft fire, the fuselage fell in a flat spiral until it crashed. 10 crew members were on board. 9 were killed in the crash except for the Navigator, 2nd Lt Wallace F. Kaufman. He was captured by the Japanese and executed. There was a myth surrounding this footage that it was an American bomb striking the wing of the plane. However, a cleaned up version of the film has been analyzed and it shows that the wing is struck from the below. So it was not friendly fire.